Martinique is a gorgeous island in the Caribbean, and it is a French Overseas Territory. The island is very popular among tourists, and one of the reasons is that there are very few places in the world with black sand beaches. The rainforests are something that tourists are interested in because you can take long walks in the middle of nature. However, by far the best thing you can do in Martinique is to experience the Gorges of the Falaise. Falaise is a river that flows through a canyon. You can explore its length by walking and swimming. Some of the areas can be crossed only by swimming, so make sure that you have the right equipment. Also, the canyon is on private property, so a fee is to be paid. Even so, you get a guide as well, which is always to be desired. Before you travel to Martinique, you need to check if you need a visa or not. Luckily, the visa policy of the French Overseas Territories is quite liberal, and you may not require one. In fact, the citizens of the European Union together with the nationals of Andorra, Iceland, Liechtenstein, Monaco, Norway, San Marino, and Switzerland are allowed to travel in all French Overseas Territories and stay there indefinitely without a visa. They can enter with their national ID card. Also, many other nationalities are visa exempt for periods that vary from 3 to 6 months, depending on the nationality. The rest of the tourists who are not exempt from getting a visa must submit an application at the nearest French diplomatic mission. 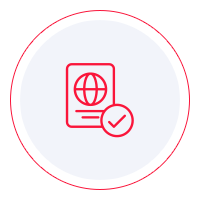 If you want to check whether or not you need a visa for Martinique, you can take a look at the list of eligible nationalities yourself. Nonetheless, using iVisa’s Visa Checker is far more convenient. All you have to do is click on the Visa Checker button you see in the top right corner and fill in the boxes. You must select your nationality from the drag-down menu on the left, and on the right, you must choose Martinique as your destination. The result will tell you if you need a visa or not, and if you do, you will be given some useful information such as a list of the nearest embassies where you can apply. iVisa cannot process applications for Martinique, but we can provide you with the information you need. If you have questions about the application process, contact our support service. It is available 24/7 and is free of charge. One other thing you must check off the list before you travel to Martinique or before you apply for a visa is to learn about the requirements. You can find a lot of information online, but we advise you to use it as a reference only. The info you see online is not always the most reliable. In consequence, we recommend that you call the issuing authority and ask your questions there. They can give you the most legitimate answers. Meanwhile, what we can tell you is that travelers who are not visa exempt and take a trip to Martinique need to have a passport that does not expire for at least another 6 months from the date of arrival. For now, we cannot help you any further with the application process, but we hope that the information above is of some assistance.